Planning birthday parties can be a pain. Where to have them, where to get the cake, what activities to plan and who to provide the food. But, what if you could plan a birthday party where everything from the party location, to the cake and food, was right in the same area? It is literally a no-brainer party! 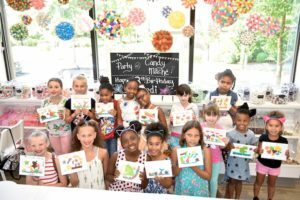 Over the summer, I achieved the perfect party trifecta for Kennedi’s 8th birthday and here is what I did. Have you heard of a place called Candy Mâché? I know, me neither! It is a hidden gem on the Issaquah Plateau and they throw candy-themed birthday parties in the most glorious candy shop you’ve ever seen! From the candy chandelier to the tootsie roll art pieces on the wall, as soon as you walk in you feel like you are in candy land! As soon as Kennedi walked in, she was greeted with a bubble gum necklace and all of her guests received ring pops. Candy Bingo: The staff at Candy Mâché were beyond pleasant and helpful. Let me tell you, they kept the kids in line and busy! The first thing the girls did was play candy bingo, and they were so into the game! Everyone got a chance to yell out bingo and when they did, they received a lollipop. Gum Drop Creations: Every child was given toothpicks and gumdrops and they were able to create little masterpieces! 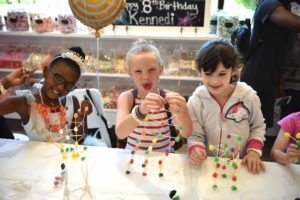 The girls were enthralled with making gumdrop towers, shapes, and sneaking a few in their mouths as they went. Tootsie Roll Art: This was most certainly the coolest activity by far. The staff heated up several different flavors and colors of Tootsie Rolls and they gave each girl a canvas. They had a ton of different mold with themes and the girls took the rolls, put them in the molds and then stuck them on their canvas. They are made little tootsie art pictures and it was so cute! Snacks: Shaved ice and CANDY! What is a candy-themed birthday party without shaved ice and CANDY! I know it freaks parents out a bit, but it truly was not that bad. Each girl got to choose their favorite flavor and enjoyed a cup of shaved ice and then they were given a small box to fill with ANY kind of candy they wanted! The girls were in heaven as they filled their little boxes with treats. 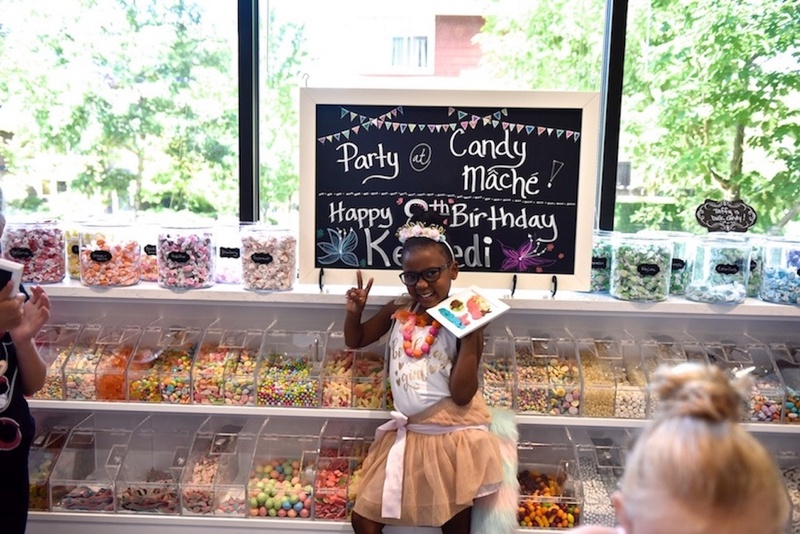 I absolutely LOVED having the first part of Kennedi’s party at Candy Mâché and I hope one of my other girls will have one there so I have an excuse to go back and eat their chocolate covered gummy bears! Thank you to the staff for an amazing party! We were done at Candy Mâché, but we weren’t done with the party! It was time for pizza… and guess what? Zeeks Pizza was RIGHT NEXT DOOR, so we simply walked next door from Candy Mâché to Zeeks, and chowed down on some killer pizza! Now it was time for some cake, and guess what now? Ben & Jerry’s was right down the street from Candy Mâché and Zeeks, so my husband went down the street and picked up the cutest ice cream cake that we had pre-ordered. Boom! “Happy Birthday” was sung and the ice cream cake was devoured! I was not kidding when I said Kennedi’s 8th birthday party was the perfect trifecta. It was one the easiest and most fun parties to date! 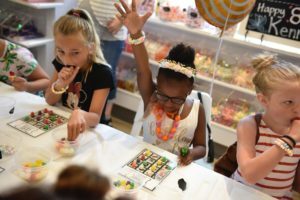 You can check out all of Candy Mâché’s party details here, or visit them in person at 1836 25th Ave. NE Issaquah, WA 98029. To check out all of Zeeks locations and menu, just click here! Lastly, to order a delicious cake from your local Ben & Jerry’s, just visit the link here!